Our beloved former superior and first prioress, Mother Cecile Jubinville, was called home to God on December 31, 2017. She was born in Pawtucket, Rhode Island on February 17, 1920, daughter of Raoul Jubinville and Leoni Laroche. After graduating from high school, Cecile studied nursing and worked in that profession for several years. Discerning God’s call to the contemplative life, she responded by entering our mother house, Mt. St. Mary’s Abbey, in Wrentham, Massachusetts, in November 1949. In those days she was considered a “late” vocation, being about ten years older than the more typical vocational candidates at the time. Mount Saint Mary’s Abbey itself had just been founded in October of the same year by St. Mary’s Abbey in Glencairn, Ireland, and so Cecile was one of the first Americans to enter the new monastery. 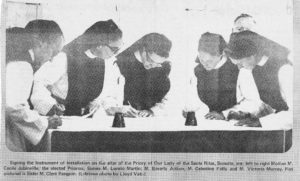 She and three other choir postulants received the novice’s habit together on June 29, 1950. They were given new names along with their new clothes and Cecile became Sister Benedict. Sr. Benedict was the only one of the group to persevere to final vows. The photo is from her profession day, March 17, 1955. Soon afterward, Mt. St. Mary’s abbess, Mother Angela, appointed Sr. Benedict to be her prioress (2nd superior). She also put her in charge of the abbey’s new candy business, Trappistine Quality Candy. The community grew so rapidly that in 1964 Mt. St. Mary’s made its first foundation, Our Lady of the Mississippi Abbey in Dubuque, Iowa. 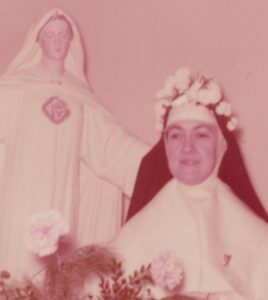 Within several years it was time to make a second foundation, and in 1972 M. Angela appointed Sr. Benedict its superior. 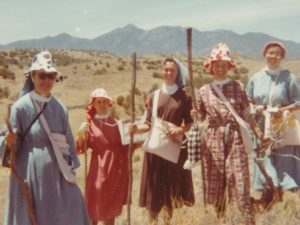 Our Lady of the Santa Rita Mountains was founded in Sonoita, Arizona on February 6, 1972 with a community consisting of Mother Benedict and five other nuns. When they arrived they moved into the small ranch house on the property. 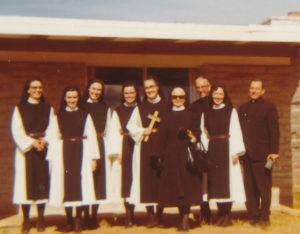 In the photo from February 6, 1972 the foundation group is standing in front of the ranch house, from left to right: Sisters Loretto, Clare, Victoria and Beverly, Mother Benedict holding the foundation cross, Mother Angela in the dark glasses, Fr. Romain Payant our first chaplain, Sr. Celestine, and Brother Dominic of St. Joseph’s Abbey, Spencer, MA. Mother Benedict took charge of the new community with a courageous spirit and good sense of humor, and proved to be a kind-hearted spiritual mother as well as an excellent administrator with great business savvy. At the urging of the local bishop, Francis Green, M. Benedict arranged for the sisters to learn about the history and culture of Arizona. They not only read books about Arizona, but there were also a few field trips to such places as Mission San Xavier del Bac and the Ted DeGrazia gallery where they met the artist DeGrazia himself. There were hikes in their immediate neighborhood to learn the lay of the land and the flora and fauna of their new home. The photo is of one such hike in the summer of 1972. 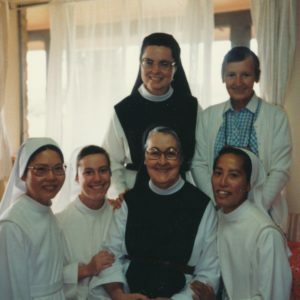 Left to right: M. Benedict, Sisters Clare, Victoria, Celestine and Beverly. Note the polka dot sun hats! The folks in Arizona weren’t quite sure what to make of these nuns from way back east, but M. Benedict’s gracious and friendly personality helped the new community make many friends among them. 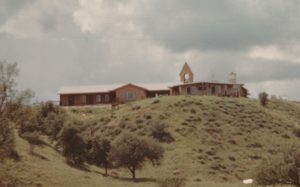 The new community was quite crowded in the little ranch house, so under M. Benedict’s leadership, they immediately began the building of two additions to the original house: a church on the south side, and a dormitory on the west. Bishop Francis Green of Tucson dedicated the new buildings on July 4, 1973. Now that the little community had a proper monastery, they could begin receiving young women interested in joining. Over the years which followed, M. Benedict received numerous postulants, clothed a whole slew of novices, professed quite a few juniors, and had the great joy of seeing the chosen few persevere to solemn vows. In the photo Mother Cecile is seated with the novitiate group of 1987. Standing: Sister Beverly, novice mistress, and postulant Sr. Jean O’Donnell; seated: novices Joan and Angela, M. Cecile, and novice Sr. Esther. The 1960’s and 1970’s were years of much change in the Church and in monastic life. Many changes had already been made before our foundation–modernizing the Cistercian habit for one. 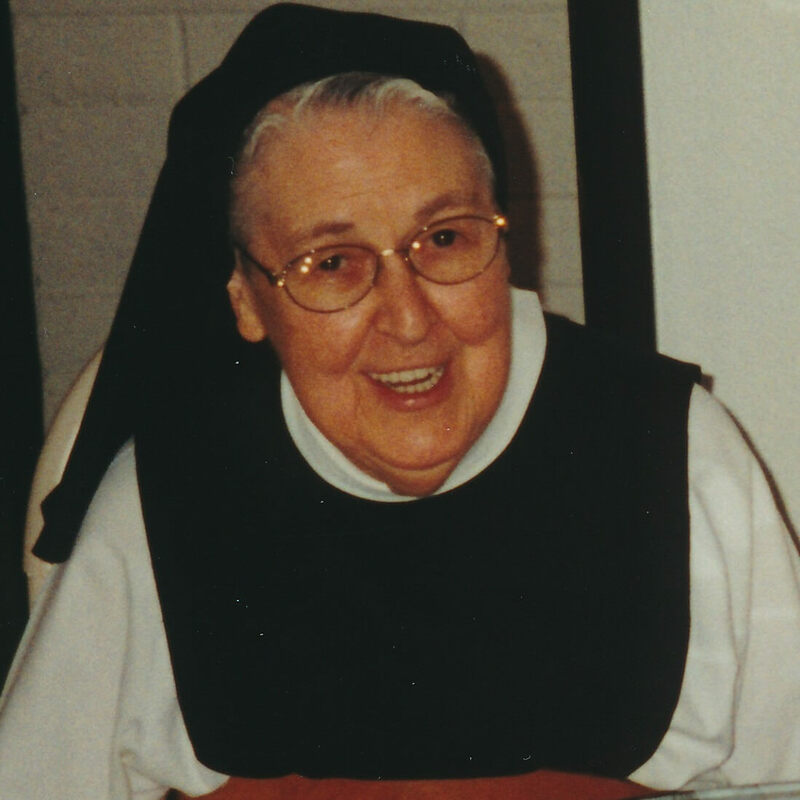 At a certain point in the early years in Arizona, Mother Benedict invited her sisters to return to their baptismal names, and so Mother Benedict became Mother Cecile. Another much bigger change was from the Latin Gregorian chant to English chant for the Divine Office and the Eucharist. It was extraordinary how using English opened up the whole wealth of the Liturgy to the sisters and to the young women who were joining them! Meanwhile, also in the early years, the new monastic community had to find a way to earn their living that would be in line with their contemplative vocation. The sisters began creating various ceramic pieces and stained glass art not long after arriving in Arizona. For the latter, M. Cecile drove Sister Clare up to Phoenix to attend classes, where one stormy summer day they were just in time to miss the surprise tornado that had just gone through the neighborhood! The sisters made many beautiful ceramic mugs and stained glass crosses, but the two crafts did not provide adequate income for the growing community. After careful consideration of various options, M. Cecile led the sisters into an entirely new venture: the making of altar breads. For this she sent Sr. Vicki to the sisters of our Order in Redwoods, CA, to learn from their already established altar bread bakery. Closer to home, the Benedictine Sisters of Perpetual Adoration in Tucson, who had been making altar breads there for many years, were also very helpful. Trappistine Altar Breads (now called Cistercian Altar Breads) started off slowly, of course, but grew steadily over the years and continues to support our community today. Around the same time that the community took its first steps in altar bread baking, the monastery of Our Lady of the Santa Ritas graduated from foundation status to the rank of an autonomous priory. This important milestone in the community’s history took place on September 14, 1978. On that day at a special Mass to mark the occasion, the elevation of the new monastery was proclaimed. Then M. Cecile and our five other foundresses transferred their vow of stability from Mt. St. Mary’s Abbey to Our Lady of the Santa Ritas. There were a few tears as this momentous step was taken! Following the Mass, the foundresses gathered in chapter and held their first election. M. Cecile was elected for a six-year term to be the first titular prioress of the new priory. In 1984, the solemn professed members re-elected her for a second six-year term. Throughout her tenure as superior and then prioress, M. Cecile raised money for and oversaw several building projects for the monastery. After the initial 1973 construction was complete, a small craft building was needed for the ceramics and stained glass work. The chaplain, Fr. Romain, needed a house, too. A room was added to the craft building for the new altar bread venture. By 1980 the community itself had grown so much that a double-wide trailer, dubbed “Bethlehem,” was brought in to house the novices who had filled the dormitory to overflowing. A larger church was built in 1983-84, and as our altar bread industry grew, we needed a larger bakery. In 1987-88 a permanent addition to the first dormitory was constructed; the trailer novitiate dormitory became offices for the bookkeepers, the liturgy department, etc. Not only did M. Cecile oversee all these projects, she also made sure that the community was never in debt–a big accomplishment in itself! The photo is from 1983 on the occasion of laying of the cornerstone for the new church. The construction crew grouped to the left consists of Leo Grombly and his sons (they did most of our construction in the 1970’s and 1980’s.) In the center of the photo are Sr. Anita, M. Cecile, Srs. 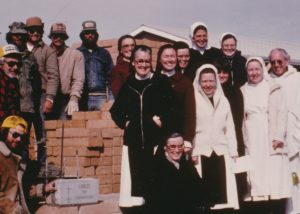 Vicki and Beverly standing together, with Sr. Clare kneeling in front of them; standing to the right in the photo are, in back: novice Jane and junior professed Denyse; standing in front: junior Aimee, postulant Martha, and novice Teresa. Standing to the left of Teresa is Fr. Romain Payant who was our chaplain from 1972-1984. In 1990 Mother Cecile completed her ministry at Santa Rita and decided to return to our mother house in Massachusetts. This was a great loss for us, but a great gain for Mt. St. Mary’s. Mother Agnes, the abbess by then, and the sisters welcomed her with open arms. Back home where her spiritual roots were, she easily slipped back into the quieter life of being just one of the sisters in community, Sr. Cecile again. In 1999 she returned to Santa Rita to help out for a while. She was an especially great help when the new altar bread equipment arrived from France with French-only-speaking technicians. Sr. Cecile was the daughter of French Canadians and grew up in a French-speaking community in Rhode Island. We could not have done it without her! She was with us, too, when her successor as prioress, M. Beverly, was dying of cancer. Her presence was a great comfort to M. Beverly and to us all. 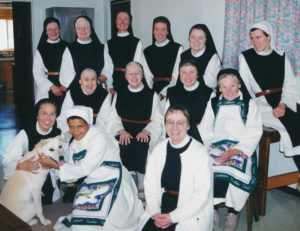 In the photo from December 1999–standing in back row: Sisters Margarita, Gabriella, Vicki, Pam, Mother Beverly seated on table with Sr. Kathy; seated in 2nd row: Sisters Cecile, Clare, Rita and Jean. Kneeling in front: Sr. Esther with half-grown puppy dog Shana, novice Julian, and Sr. Melody. 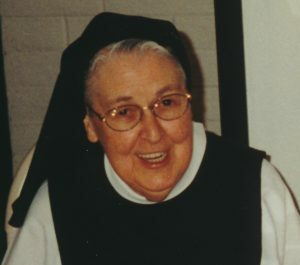 Sr. Cecile returned to Mt. St. Mary’s in 2001. We stayed in touch over the years, and she always assured us that she prayed for us everyday. We are grateful to Mother Maureen, Sister Katie, and all at our mother house for their tender care of her in her final years. We are so grateful for our Mother Cecile’s ministry to our community throughout the first eighteen year of our history! She was a true spiritual mother to us and we missed having her loving presence in our midst. She will forever have a special place in our hearts!